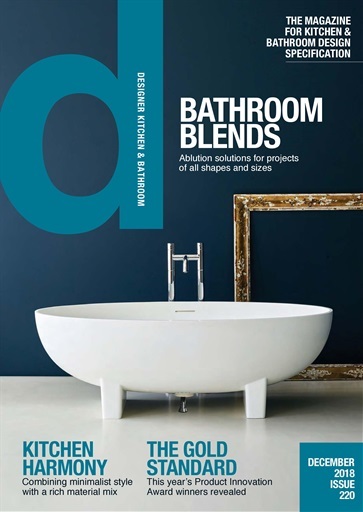 Welcome to the December issue of Designer Kitchen & Bathroom. As another year draws to a close, we take the opportunity to round up some of the star products that have been really making waves during 2018. It has been another bumper year for new innovations across the kitchens and bathroom sector, so we picked out a few of our favourites. 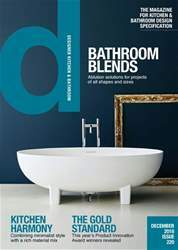 We also celebrate some of the award-winning products from this year’s Designer Kitchen & Bathroom Awards. Our selection includes a broad range of clever designs, each of which have been crowned as well-deserved gold award winners. trends that are shaping the best designs for projects of all shapes and sizes. From brilliant basins and luxurious bathtubs to striking showers and eye-catching tiles, there are plenty of ways to make a statement in what is one of the most important spaces in the home.